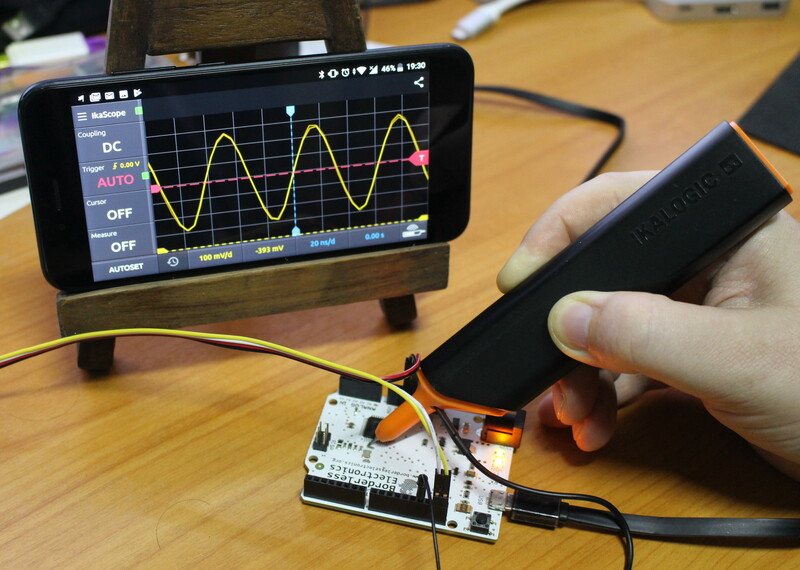 A couple of weeks ago, I received IkaScope WS200 pen-like WiFi oscilloscope, as well as ScanaQuad SQ50 USB logic analyzer & signal generator, and I’ve already checked out the hardware both both in a aforelinked unboxing post. I had also very shortly tried IkaScope with GOLE 10 mini PC, but just to showcase potential use case for a Windows 10 mini PC with an inclined touchscreen display. 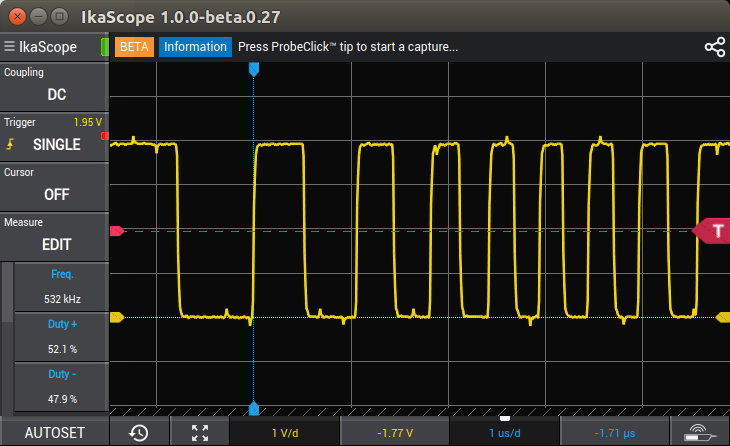 But at the time I did not really a proper measurement, as it was more to test the mini PC than the oscilloscope itself. 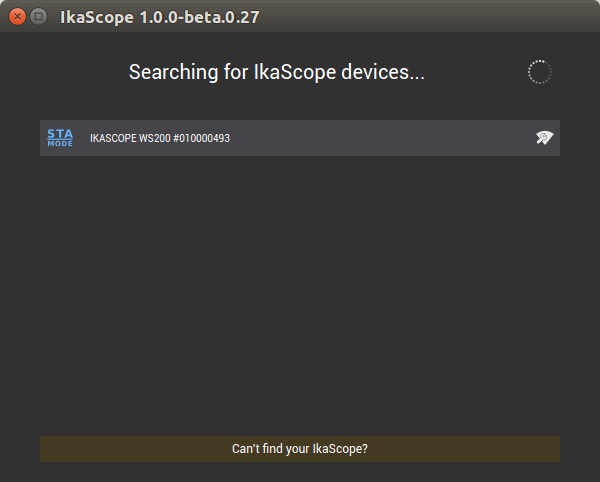 I’ve now had time to test IkaScope desktop program and mobile app in respectively Ubuntu 16.04 and Android 8.0.0, as well as ScanaStudio for ScanaQuad USB device using Ubuntu 16.04 only, since there’s no mobile version of the program. While I’ll focus on Ubuntu and Android, most of the instructions will be valid for Window 10 and Mac OS X for the desktop programs, and iOS for the mobile app. This will be more of a getting started guide / basic tutorial, than a review, as I’ll go through some of the issues I may have come across, and show the basic functions of the program/app. 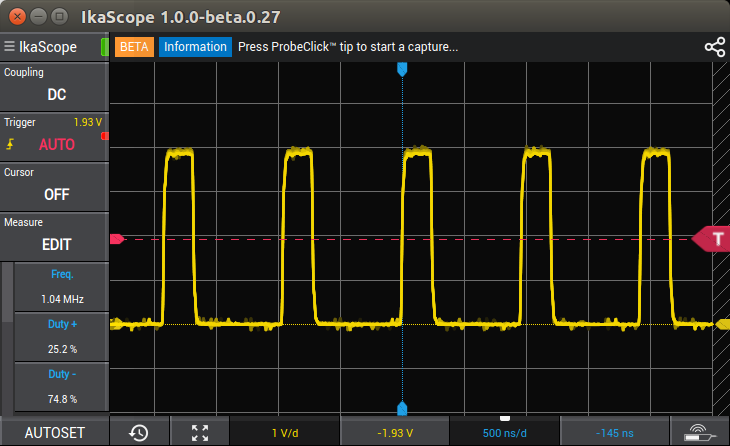 My original plan was to test the oscilloscope with my computer running Ubuntu 16.04, and then switch to Android. However, my computer is connected to the network via Ethernet, and I don’t have a spare working WiFi dongle anymore. 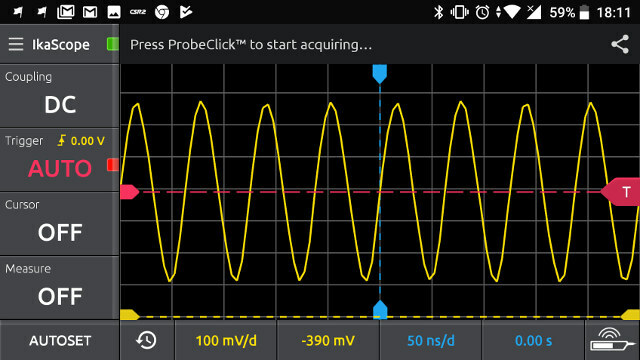 The oscilloscope can also work with Ethernet only devices, as long as WiFi is configured in station mode, but by default it starts in access point mode, so I had to change my plan and instead install IkaScope Android app on my smartphone first. The app is still shown to be in development / a beta version, but as I did not encounter any critical issues, except at the beginning. 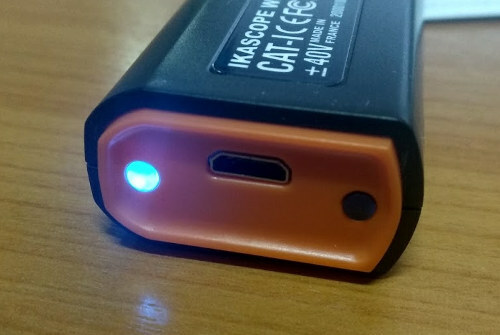 To turn on the oscilloscope you have to press the probe tip, and should soon see the white LED blink, meaning some “IkaScopexxxx” access point should be setup and ready to go. 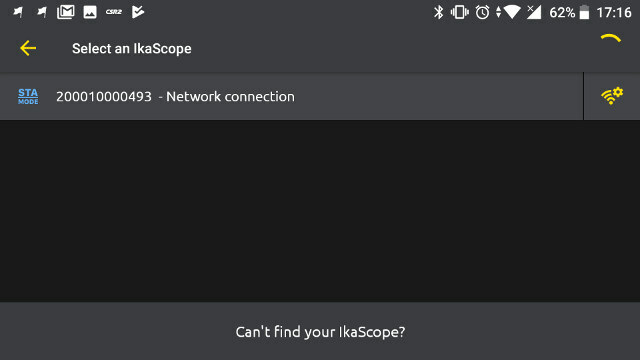 However, after several attempts, I failed to find any IKASCOPE ESSID in the list of access point. 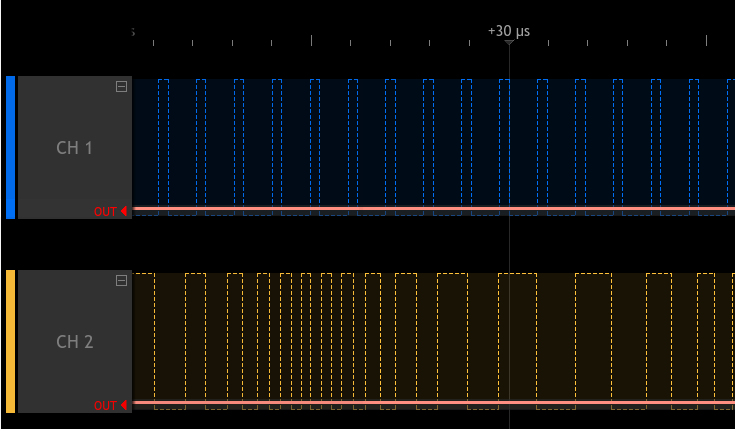 Based on some recommendations on the Internet, I installed WiFiManager, and lo-and-behold IKDASCOPE-…200-00493 SSID showed up. I could easily connect to it, and since it’s an open network, no password is needed. Time to launch IkaScope app. First you’ll go through a very short wizard showing the key zones in the app, and then we can tap on the top left corner, and click on Connect. 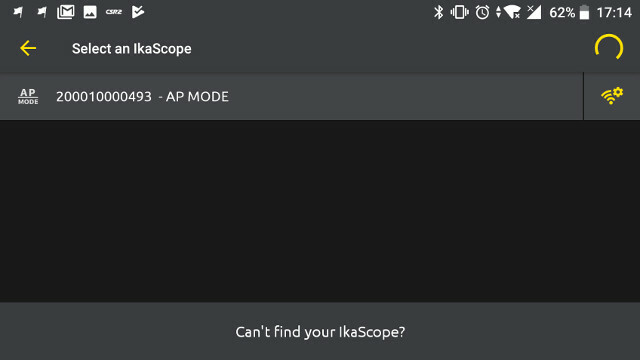 It should then show your IkaScope in AP mode (White). While you could just select it, and start measurements like when I did when I played with in in Windows 10, it is recommends to switch to station mode. 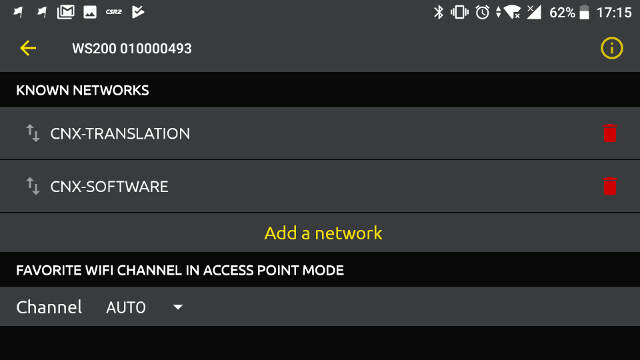 To do so, tap on the setup/configuration on the right side, which should bring you to the “add a network” page as shown below. You can add just one, but if you add more, you’ll likely get better coverage. 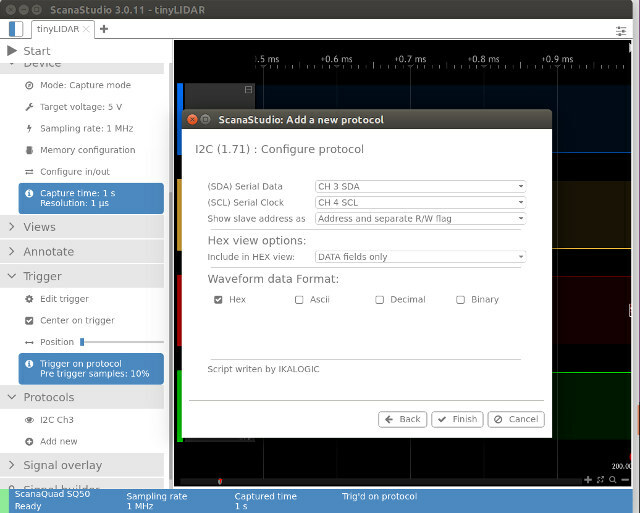 Note that the oscilloscope on supports 2.4 GHz, so your 5 GHz ESSID won’t show up. .. STA mode (Blue) icon will have replaced the AP mode (white) icon in the mobile app. Go back again, and you’ll see IKASCOPE WS200 connected in station mode. 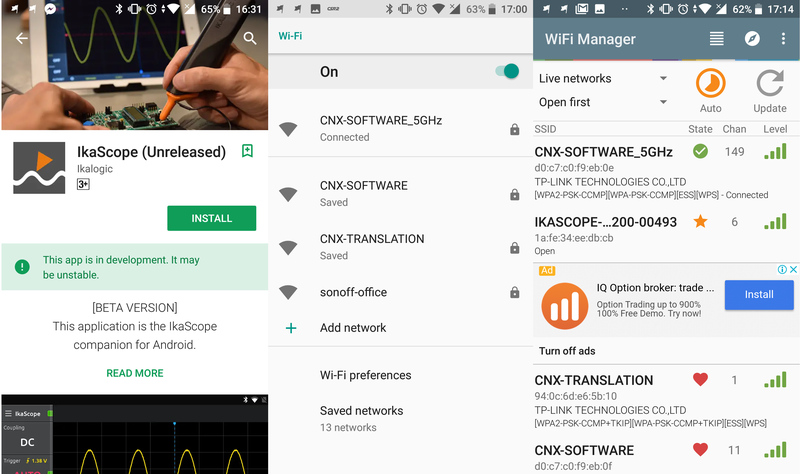 The screenshot below also shows “CNX-SOFTWARE_5GHz” ESSID, but that’s the connection used by the phone, not the scope. I’ll detailed the options about the app into more details in the Ubuntu section as they have the same features, and I could only find some cosmetic differences between the mobile and desktop version. I still used the Android app to measure the 16 MHz clock signal from an Arduino Leonardo clone as shown in the top picture. You can see a short demo about the measurement below. 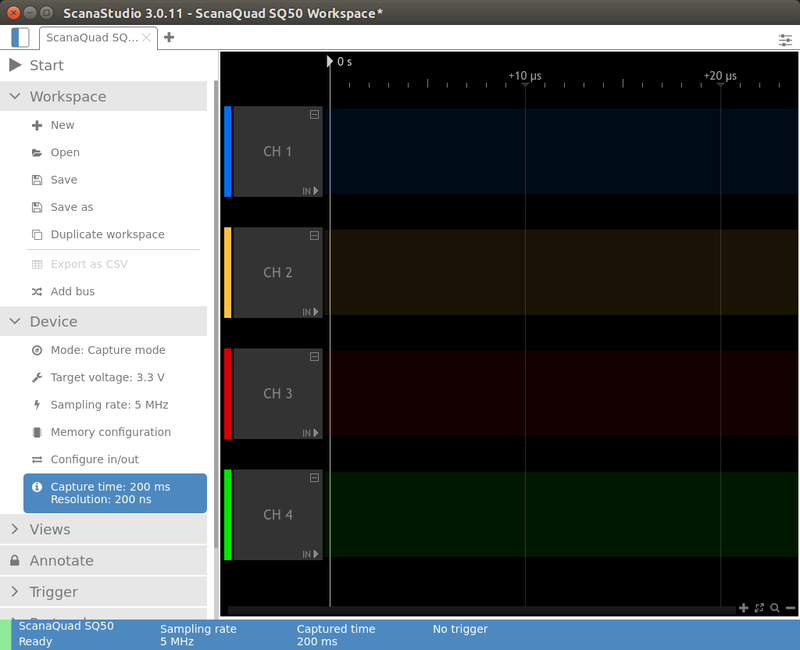 Now that IkaScope WS200 probe is in station mode, I can use it with my Ethernet connected Ubuntu 16.04 computer. 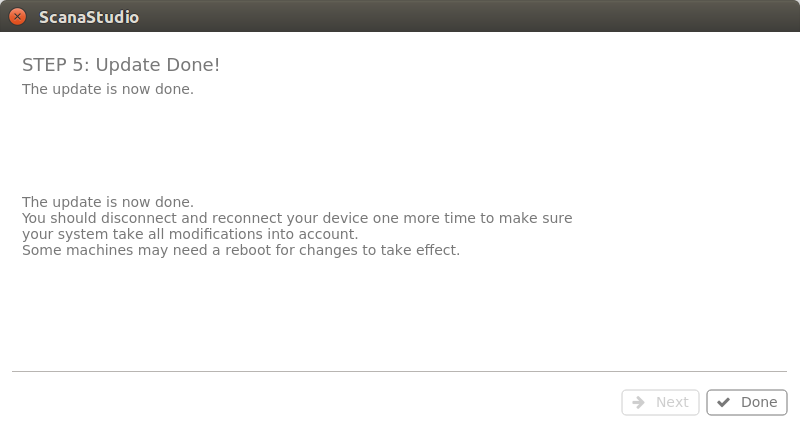 There’s also a an uninstall.sh script to remove the program if you don’t need it anymore. Note the tools only work on 64-bit x86 platforms (x86-64). Just like in Android, you’ll get through a short “tutorial” at the beginning showing the main parts of the interface. 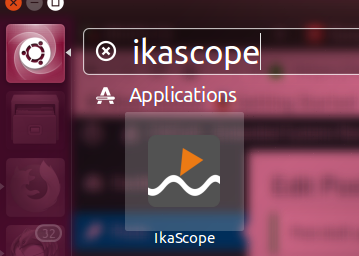 Click on IkaScope icon on the top left corner of the program, and connect to find IkaScope. 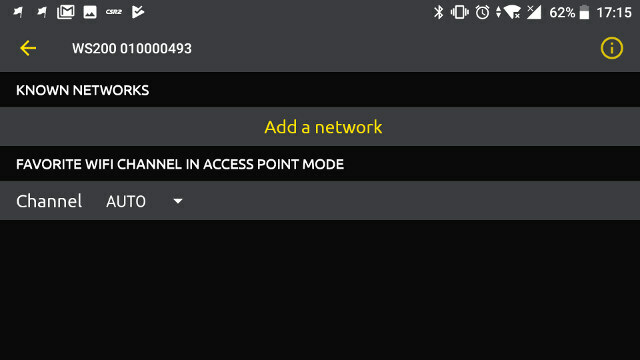 My probe was already setup in Station mode, so all I had to do was to select, but if you are using a computer with WiFi, and WS200 probe is in AP mode, you’ll need to connect to the access point, and ideally change that to station mode as shown in the Android section. I did the same measurement on Arduino Leonardo board, but without using AUTOSET at first. You could then change the voltage and time resolution and offset as needed, but in most case, you’ll probably want to simply use AUTOSET to let the program automatically select the best settings. A 16 MHz signal has a 62.5 ns period, so first I used the cursor in TIME mode, and moved A and B to confirm both the period and frequency. Cursors can also be used for voltage (vertical scale). An easier to check the frequency is to use the Measure menu, which allows to automatically reports frequency, period, width, duty, voltage average/peak-to-peak/rms/max/min, and rising and falling times. Other options include coupling (DC or AC), and Trigger which can be set to automatic, normal, single, rising / falling / both edges as shown in the screenshot below. There’s no math function, but I’ve read the company may implement FFT and other functions in the future. 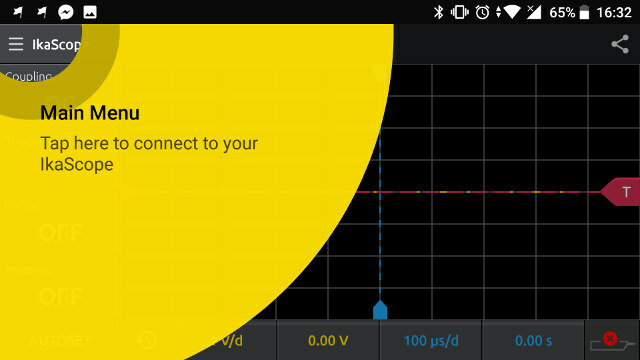 I charged the oscilloscope around two weeks ago, and battery level is still well higher than 50%, even after that review. The company estimates a charge should last around one week with a typical use. That’s because the oscilloscope will automatically turn off if it is not being used. 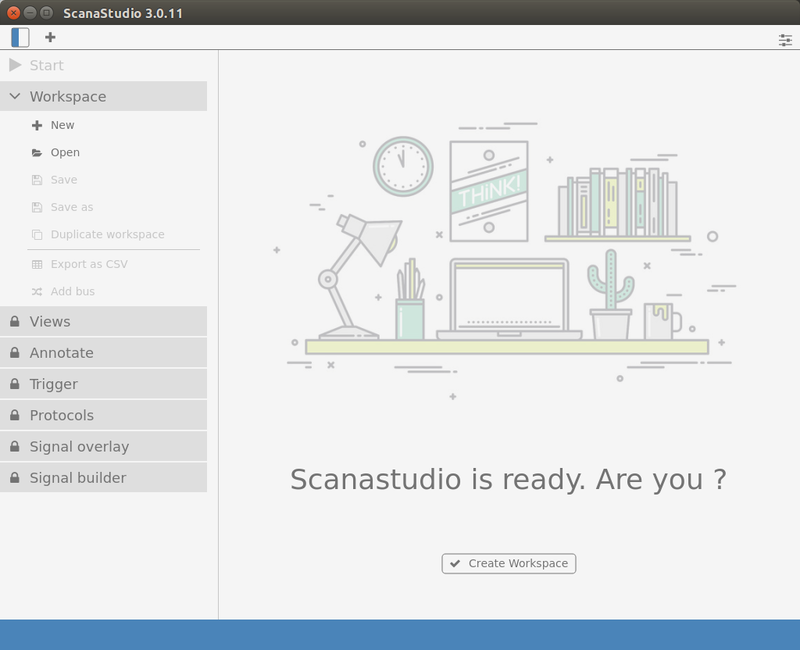 Contrary to Ikascope program, ScanaStudio will install on both 32-bit and 64-bit x86 operating systems. An uninstall script is also provided. 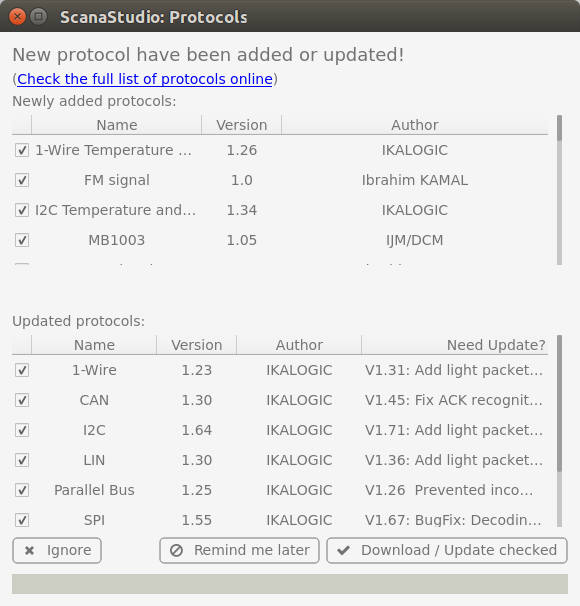 Click on Download / Update checked button to have the latest protocols loaded into the program. After that, you should get to the main user interface. 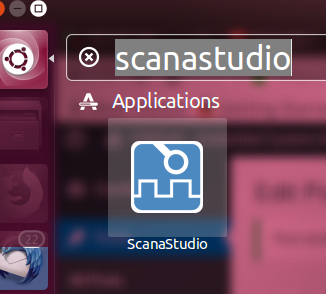 I clicked to create a new workspace, which showed several ScanaQuad “demo” devices, but no way to connect to the actual hardware. However, after searching in the knowledge base, I found out I may have to use the Device wizard compatibility, which can be accessed from the top right icon, and will start a 5-step wizard asking you to disconnect any SUB serial device – including your ScanaQuad -,and reconnect the ScanQuad. Everything is pretty self-explanatory, and this step may be needed in either Linux or Mac OS X, but not in Windows. You should now see your ScanaQuad USB logic analyzer listed when creating a new workspace, possibly after a reboot (but not needed here). 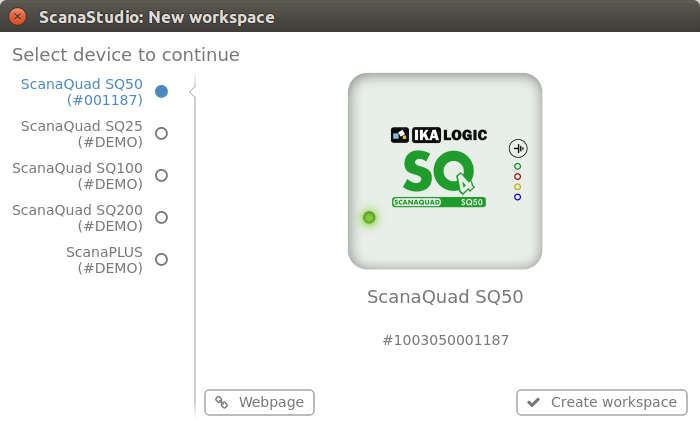 I selected ScanaQuad SQ50, and clicked on Create workspace button. 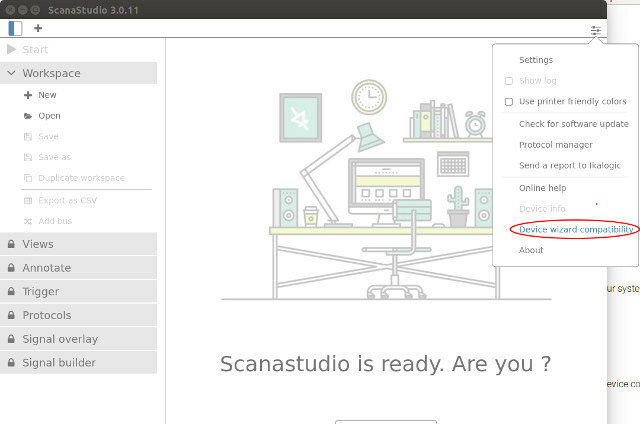 The very first time, I had to wait as ScanaStudio updated ScanaQuad firmware, which took around a minute. Your workspace should now be shown with the 4-channel used by the tool and some default configuration. 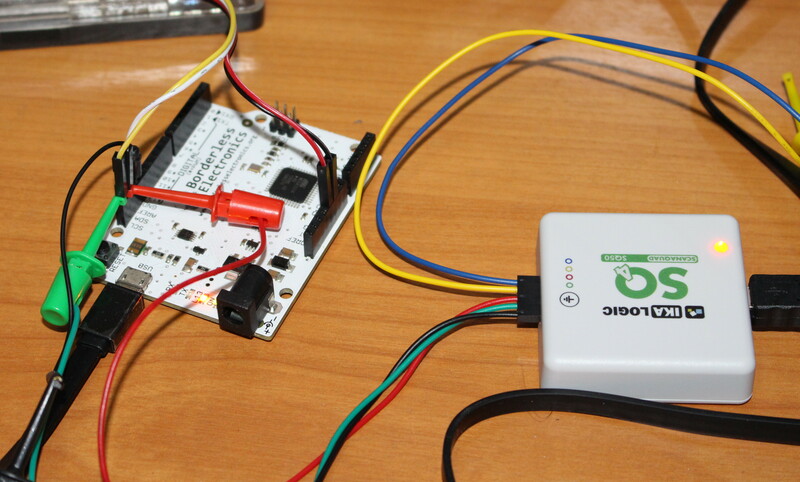 Since last week I reviewed tinyLIDAR, a board based on STM32L0 MCU + VL53L0X ToF sensor that returns the distance from obstacles up to 2 meters away, and that interfaces with the host processor over I2C, I decided to monitor I2C signals with the device. I connected the black probe to a ground pin, the green probe to SCL, and the red probe to SDA as shown above. 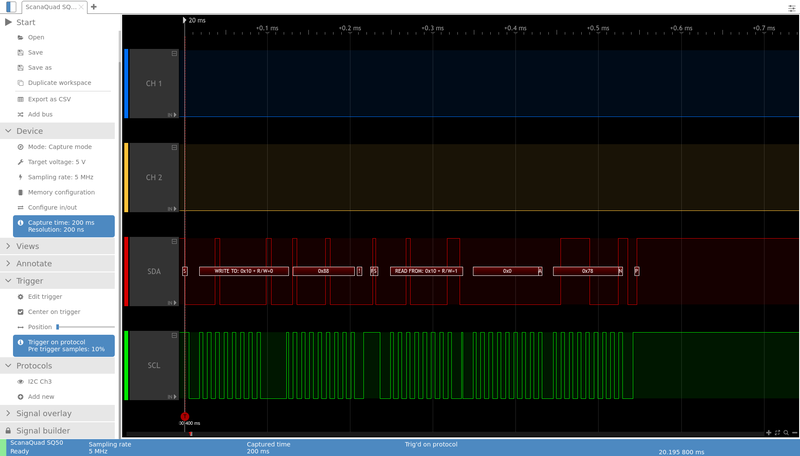 In ScanaStudio, I set sampling rate to 1 MHz, voltage to 5V, clicked on Add new in the Protocols section, selected I2C from the list, assigned CH 3 (Red) to SDA and CH 4 (Green) to SDL, and clicked Finish. 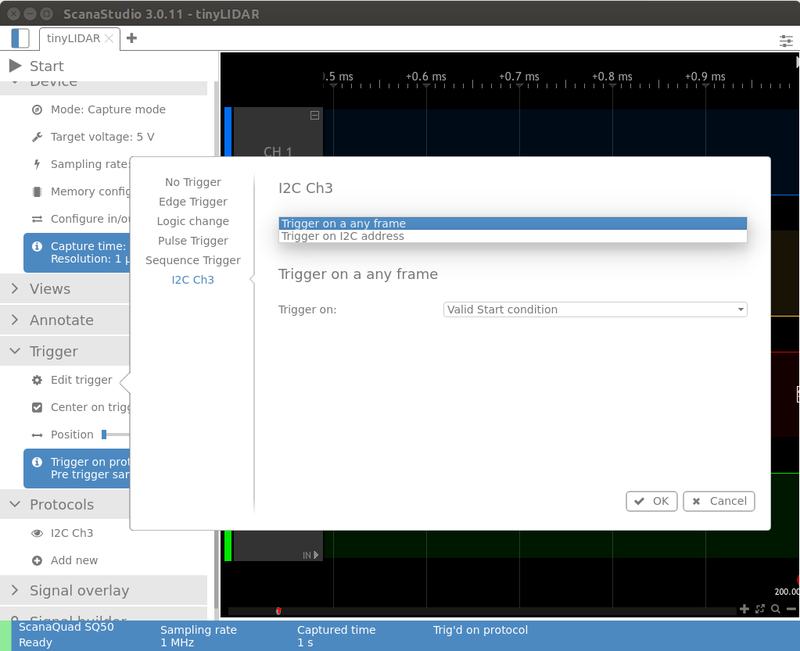 Finally, I also set a trigger to start capture whenever I2C signals are detected. Now we can click Start at the top right of the interface to make the program wait for the trigger. Going the “Arduino GUI terminal” for tinyLIDAR board, I press enter to read distance (2 byte) from I2C device with address 0x10. The command ‘D’ should be 0x44 according the ASCII table, and the distance returned is 120 mm. I would have expected 0x44 (‘D) in the write command, but for some reasons I have not looked into, the command is shifted by one bit. The read data is however fully as expected as 0x78 converted to 120 mm. I then made the sensor to face the ceiling in order to get a longer distance and use the two fields. The terminal reports 1823mm, and the I2C capture show 0x071F distance which indeed converts to 1823 mm. So all good here. 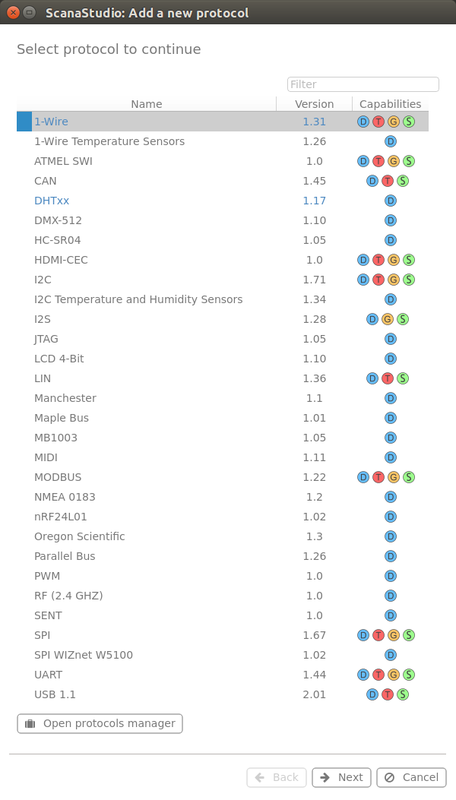 If you’re interested in the other supported protocols, you could check out the aforelinked Github repository, and the screenshot below (correct as of February 5, 2018). 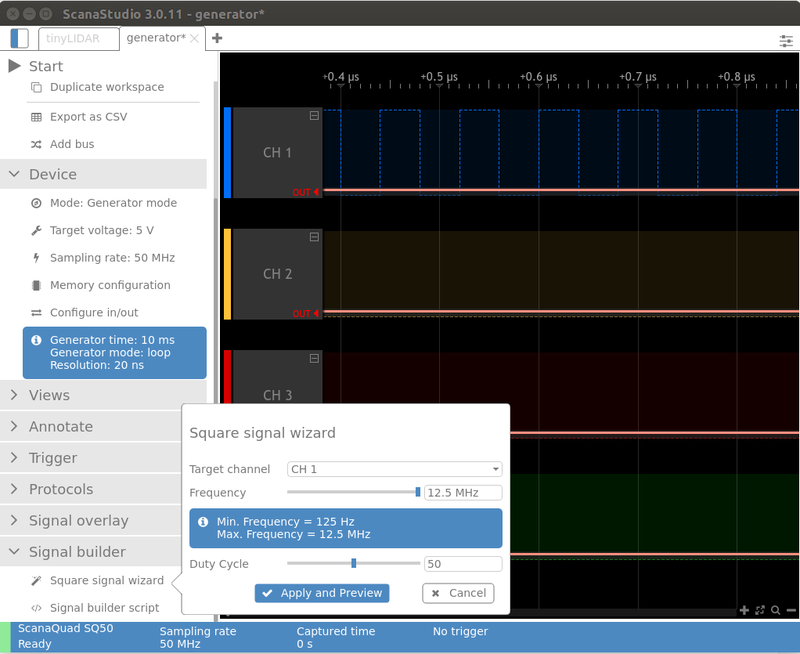 Square signal wizard up between 1 Hz and 12.5 MHz (min/max values depend on sampling rate) with with duty cycle slider. Instead of feeding back the signal to the device in mixed mode, I used SQ50 to generate signals, and WS200 probe for measurement. Not what I would call a neat square signal, and the 25% duty signal is not quite right either due to the distorsion. 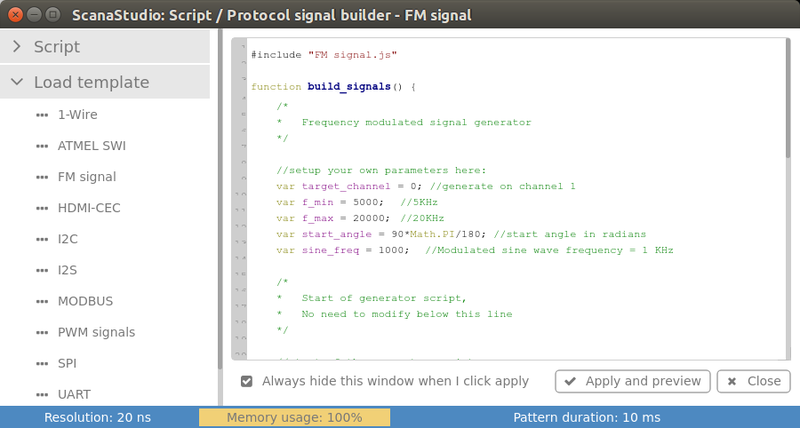 Let’s lower the frequency to 1 MHz with the same duty cycle. That’s more like it, although there’s still some noise. 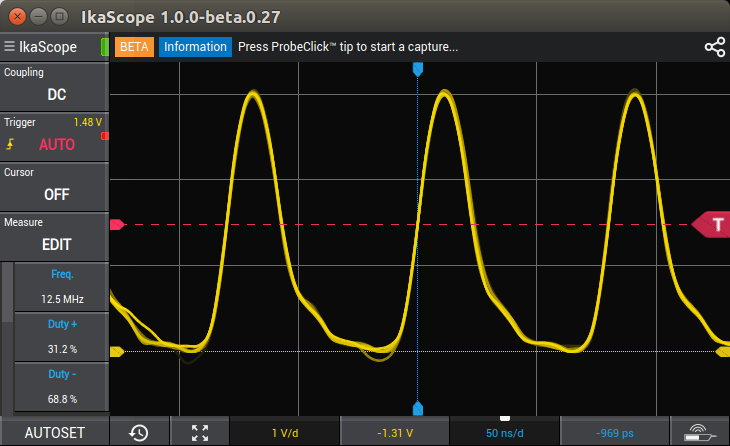 The waveform looks fairly good, and matches the one defined in ScanaStudio. I’d like to thank Ikalogic for the opportunity to test their measurement devices. 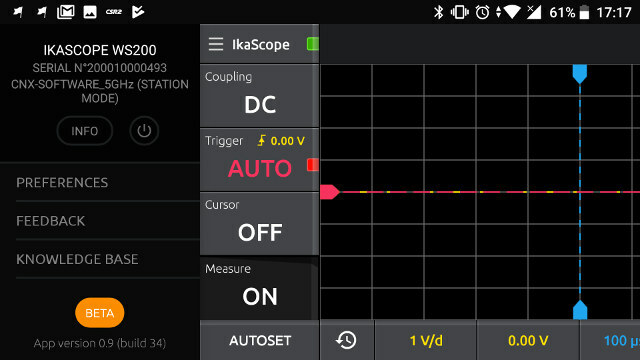 IkaScope WS200 oscilloscope sells for 299 Euros exc. VAT, while ScanaQuad SQ50 goes for 89 Euros exc. VAT, and other USB LA+SG models with better specifications such as SQ200 go for up to 149 Euros.